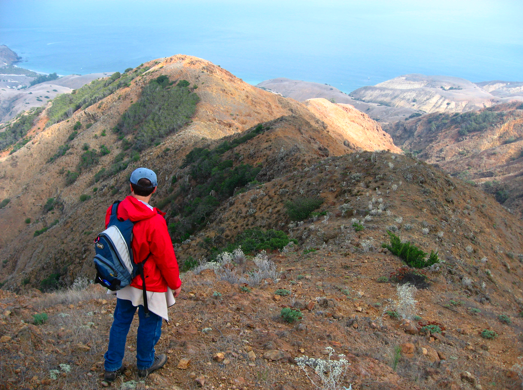 Santa Cruz Island sits about twenty miles off the southern California coast, and is an amazing place to camp and hike. Never inhabited except by the Chumash Indians and a few sheep ranchers, visiting it is like a trip back in time. Completely undeveloped, without paved roads, power lines or pretty much any other reminder of modern life, it’s impossible not to relax! There’s daily scheduled boat trips from Ventura, it takes about an hour, and you’ll often see some dolphins or whales as you cross the channel. You cross the shipping lanes, so you may be lucky enough to see a container ship up close too. Call me crazy, but I think they’re one of the wonders of the modern world, and always inspire a sense of wonder. Go to IslandPackers.com to reserve your boat ride. With over one hundred square miles of back country, there’s a lot to explore. I’d recommend picking up a commercial map before you go, such as National Geographic’s, but I’ve also created a Google map showing the trails I’ve hiked on the eastern National Park side of the island. You can check out the map to build your own trips, but I’ll describe a few of my favorites here. The landing point for the eastern side of the island is at Scorpion Harbor. This is the quickest and easiest loop, at 1.6 miles, though it does have some steep sections of uphill. You start off up the cliffs on the north side of the harbor, on a tough uphill climb. If it’s clear, at the top you’ll be rewarded with some great views of both the mainland, and the rest of the island. You then follow the trail along the top of the cliffs to Cavern Point, a bare patch at a cliff-top, where you can look west along the rugged coast. You can then take a fire road back, past the ranger’s huts, but I prefer going a little further along the trail, and then following a trail down a gully to the lower campground. When you’re going down the gully, check out the stone dams built to check erosion. They’ve lasted for decades, despite being dry stone construction, and were built by Italian stone-masons all over the island. Once you’re at the lower campground, follow the main fire road east back to the pier. 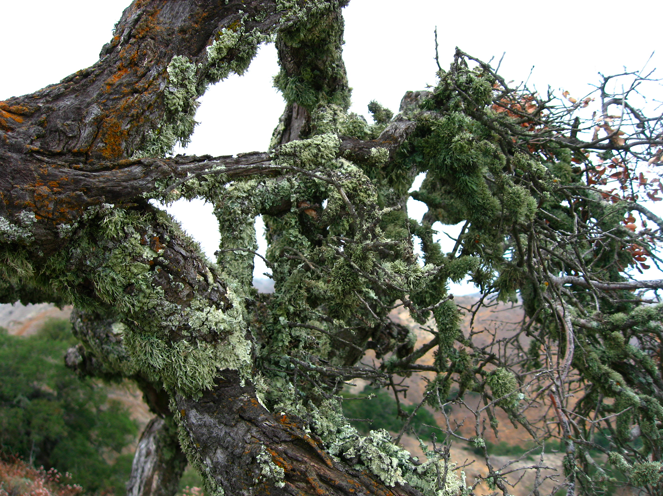 Breathe deeply as you pass through the eucalyptus planted by the ranchers. They may be non-native (like me! ), but that smell always brings me back to the island. From Cavern Point, you can just follow the cliff-top path until it joins with a fire road. Take that for another mile, and you’ll be there. There’s a route known as the Quad Trail that branches off near Potato Harbor overlook. This is mostly unmaintained, and unmarked on most maps. Me and Liz followed it for a couple of miles, it had a lot of punishing uphill, but was generally clear and in good shape. I wouldn’t recommend it unless you’re an experienced hiker. You can head over to Smugglers Cove by following the fire road up the hill on the south side of Scorpion Canyon, visible from the pier. You won’t see it whilst you’re hiking on it, but there’s some magnificent rock walls supporting the road, built by the Italian stone-masons. It’s around four miles to Smugglers, but there’s a lot of uphill, so it’s harder than you might expect. There’s a lovely grove of Cypress trees visible from the fire road. You can take a short-cut through this grove on a single-track trail, and it’s a perfect spot to recover from the struggle up the first hill. Planted for the rancher’s daughter to enjoy, it adds to the Mediterranean atmosphere. Turn to the east when you get to a junction with another fire road, and you’ll be headed to Smugglers. Once you arrive, you’ll see a grove of olive trees planted by the ranchers, which always makes me wish I’d brought the rest of a martini. Smugglers Cove has an old Ranch House, but the best part is the beach. Exposed to the Pacific, you often get majestic surf rolling in. The Old Oil Well trail is very hard work, you gain a lot of elevation over a short distance. At the top, it joins up with a fire road, and a few hundred feet away is an old oil drill, with a drilling head left next to the trail. This is from an exploration effort many years ago, they dug down several thousand feet, but all they found was water! It was cheaper to write off the equipment than ship it back to the mainland, so here it sits, slowly rusting, good fodder for future archaeologists. You can take the Old Oil Well fire road back down to get back to Scorpion Harbor. This is the longest and hardest trail we’ve taken on Santa Cruz. It’s 4.5 miles each way, and takes you to the highest point on the eastern island, Montanon Peak, at 1808 feet. You start off by heading to the Old Oil Well, either by the fire road, or the Scorpion Canyon trail route. Once you’re at the well, continue west along the fire road. The trail itself is pretty well marked, with some signs added recently. Along the way, keep an eye out for the aircraft crash site. I don’t know the story behind this one, but there’s some old wreckage still visible as you pass over a rise. Stick to the ridge, and head south and uphill, and you’ll find yourself at Montanon Peak. You’ll know you’ve arrived when you see a small hut, and some solar panels, for the radio equipment that’s housed up there. I recommend taking the same trail back, but some maps do show a partial connector to Smugglers. We tried to make a loop down that way on our last trip, and it was a really horrible experience. The trail is non-existent, and getting down involves some scary rock scrambling. Liz had a nasty fall, and was lucky not to be injured beyond cuts and bruises. I’ve included the rough route we took in my map, but marked it in red, and I highly recommend not following in our footsteps! Funhouse Photo User Count: 1,638 total, 77 active. I’m wondering if the stats are having a problem, since this seems to be exactly the same as last night? Event Connector User Count: 61 total, 8 active. I just refreshed, and went from 48 total to 61, so there’s definitely something wild and whacky going on with Facebook’s statistics. Thank you for the info, we just went this past Sunday 5/6/2018 and had a great time!